The Honokaa High School Jazz Band is on its 2018 Oahu semester tour . The band is playing at several venues over the next few days. 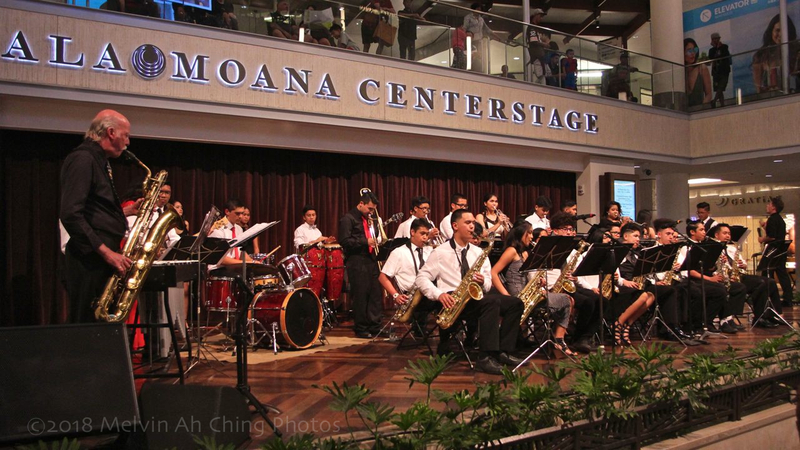 Last night (April 19) they played at Centerstage at the Ala Moana Center. Under band director Gary Washhburn, the band wows crowds with their renditions of popular jazz, pop and rock tunes. The band showcased their virtuosity by covering popular standards such as “Route 66,” “Cry Me a River,” “Moondance,” “The Closer I Get To You,” and several others. Washburn has written music for the band. They played two of his upbeat, toe-tapping, instrumental compositions which showcased the talents of various members on keyboards, drums, sax and brass. You can learn more about the Honokaa High School Jazz Band from their Facebook page.